This adorable bundle of silky fur is Flossy, named after the softness of her fur. 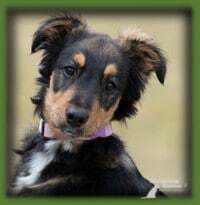 She is 5mths old and is a German Shepherd/Collie mix who just may be the sweetest pup you will ever meet. She isn’t an overly large dog and will probably finish out around 40lbs. Flossy has a story to tell and is a special needs pup so please be sure to read her whole bio thoroughly if you are interested in this darling. Flossy is a complete love of a dog. She is a total sweetheart and is very friendly and affectionate with everyone she meets. She is a very social pup and loves meeting new people. Flossy is at her happiest when she is lying on your lap, belly up, getting belly rubs and scratches. She is a total lap dog and cuddler. The more cuddling the better for her. Flossy is also a gentle pup and is not nippy like some pups; she takes treats gently and would be a very suitable puppy for a home with children. Flossy does occasionally try to jump up but we are working on this. She is very receptive to training and we are making great headway. Her adoptive family will need to continue to work on this. Flossy is currently attending puppy socialization classes and is head of the class! She is very intelligent and has learned her obedience skills easily and is so responsive. She also plays nicely with the other puppies and is never the one needing a time out. 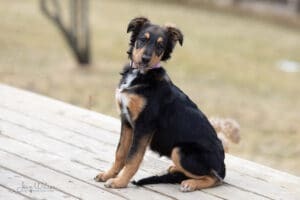 Her new family will be expected to get her right into obedience training to continue her learning skills and bring out the best in this great dog. Flossy lives with other dogs and really enjoys their company. She loves to run and play with them and gets right in there with wrestle play. 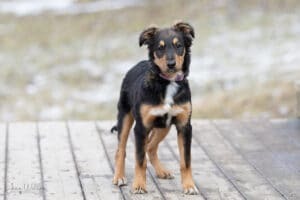 We would love her to go to a home with another dog but this isn’t a necessity for her as she would do equally well getting all of her family’s time and attention, but she would need to have regular socialization and play dates with other dogs to keep her dog socialization up. Flossy is also living with cats in her foster home and pretty much ignores them. She would be a fine pup for a home with a tolerant cat. when she knows it is crate time. 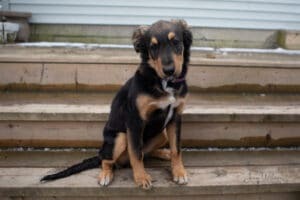 She is also doing quite well on her house training and with proper supervision will be fully house trained in no time. We had a slow start to her housetraining due to her medical issue but are on track now and she is responding well! level. We do though need to advise that at this point, overnight, Flossy cannot hold her urine. It is just too long of a stretch for her. She cannot hold her urine for more than a few hours and this is a biological condition of hers, not a training issue. We are hopeful that with maturity this will improve as she gains stronger bladder control. We are also tinkering with her medication dosage, with our vets guidance, to see if we can help her in this regard as well. But for now, this is her reality. She would be a dog suitable for doggie diapers overnight if that was her person’s choice. We just have a stack of old towels we use for her and switch out a clean towel for a soiled towel every morning. This is why it is imperative that she is crated overnight, so that she is contained and not messing in the house. so apartment living is out. When Flossy has to urinate, she has to go NOW, so quick access to the yard is a must. Although our girl has some special needs, she makes up for it ten-fold with her sweet and affectionate nature. She will be a loyal and devoted dog to her people. This is a very special puppy who is so deserving of a loving forever home. What she doesn’t need is someone to feel sorry for her; we are not looking for sympathy applications here. 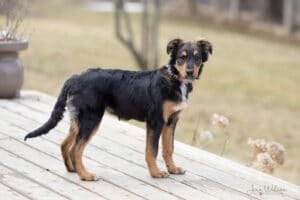 What we are looking for is some person or family who is looking for an amazing dog, is willing to treat her like any other dog, but has that extra room in their hearts for a special needs dog and will ensure that she has a great, fulfilled life.